Argonne ecologists Roser Matamala (front) and Mike Miller (right) with University of Alaska Fairbanks collaborator, Gary Michaelson (left), collect samples of permafrost-affected tundra soils in northern Alaska. (PhysOrg.com) -- A significant source of greenhouse gases has started leaking into the Earth's atmosphere from an unlikely place. Above the Arctic Circle, land frozen for tens of thousands of years has begun to thaw for the first time. Current estimates indicate that perennially frozen ground, called permafrost, holds more than twice the amount of carbon present in today's atmosphere. As permafrost thaws, a huge amount of this stored carbon could be released as carbon dioxide or methane gas. In more temperate environments, most of the carbon in dead plant material cycles relatively quickly back to the atmosphere thanks to the action of microbes that break down organic materials. However, the remains of dead plants have accumulated for millennia in the permafrost soils and sediments in regions like the North Slope of Alaska and Siberia. "Once organic material gets incorporated into permafrost, it's pretty much out of the system. It's like keeping food in the freezerthe rate of decomposition is dramatically slowed," said Julie Jastrow, an ecologist at the U.S. Department of Energy's (DOE) Argonne National Laboratory. "As long as the soil or sediment stays frozen, there's very little microbial action to decompose the organic matter," Jastrow added. "Once the soil does start to thaw, though, microbial activity will increase, and as the microbes feed on the organic materials, some of the carbon will be released to the atmosphere. The concern is that this added source of greenhouse gases would then speed up the warming process, leading to even greater thawing of more permafrost." The freeze-thaw cycles associated with the Arctic tundra produce a phenomenon known as cryoturbation, in which the top layers of soil churn together with lower layers. According to Jastrow, thousands of years ago this process transported dead plants downward through the sediment into the permafrost before they could be decomposed. "The issue is that there's lots of relatively easy-to-decompose carbon that's buried down there, but it's protected by being in a frozen state. If it thaws and the microbes act on it, thenjust like the burning of fossil fuels you're going to release carbon that has been out of the global cycle for a long time, and it really can't be put back where it came from. What we don't know yet is how much of this ancient carbon will be released, how fast, and in which form carbon dioxide or methane?" she said. For researchers and policymakers concerned about climate change, one particularly troubling aspect of permafrost thaw lies in the fact that these soils and sediments typically contain a large amount of ice. If water from thawing ice drains away, carbon emissions will be mostly carbon dioxide. But in poorly drained areas, water ponds up and a significant amount of methane can be emitted. When carbon is released as methane, it will generate 25 times the warming effect over a century that would be produced by its release as carbon dioxide. Jastrow and her colleagues at Argonne and the University of Alaska-Fairbanks took samples of permafrost soils from the North Slope of Alaska between the Brooks Range and Prudhoe Bay. 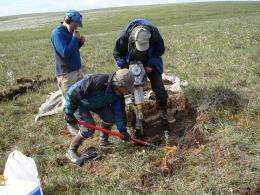 By closely examining the chemical forms of carbon and minerals in permafrost soils and by observing the behavior of microbes feeding on the carbon as these soils are slowly warmed under different drainage conditions, the researchers plan to develop decomposability indicators and predictive models that can be used to better anticipate the fate of carbon in thawing permafrost. The Argonne research will focus on terrain throughout the northern permafrost region, which includes shrubland, boreal forest, and peatland below the Arctic Circle, in addition to tundra. "Our mandate is to look into both the quantity of carbon as well as its potential decomposability. Permafrost researchers now believe that there's significantly more carbon in these regions than most people previously thought, but we still only have very crude estimates," she said. Ultimately, the Argonne efforts will support DOE's goal of developing climate models that can better predict impacts to different biomes. Understanding the long-term behaviors of terrestrial ecosystems requires a more comprehensive picture of the different factors controlling how carbon cycles between the land and the atmosphere in different regions. "We're frequently faced with the question of whether our measurements are off or our models are off, and typically it's some of both," Jastrow said. The Argonne studies will provide the valuable "ground truthing" data needed to test and improve carbon cycle models being developed for permafrost regions. Future research will involve the sampling of more sites, particularly in lowland areas that are wetter and less accessible, as the DOE continues its effort to couple carbon models with climate models. A significant source of greenhouse gases has started leaking into the Earth's atmosphere from an unlikely place. Above the Arctic Circle, land frozen for tens of thousands of years has begun to thaw for the first time. Current estimates indicate that perennially frozen ground, called permafrost, holds more than twice the amount of carbon present in today's atmosphere. As permafrost thaws, a huge amount of this stored carbon could be released as carbon dioxide or methane gas. "The issue is that there's lots of relatively easy-to-decompose carbon that's buried down there, but it's protected by being in a frozen state. If it thaws and the microbes act on it, thenjust like the burning of fossil fuelsyou're going to release carbon that has been out of the global cycle for a long time, and it really can't be put back where it came from. What we don't know yet is how much of this ancient carbon will be released, how fast, and in which formcarbon dioxide or methane?" she said. evidence has been found of palm trees in Alaska whilst from Ellesmere Island, inside the Arctic Circle, fossils have been found of a Pantodont, a plant-eating hippopotamus-like creature weighing about 400 kilograms. Of course, I'm not buying their statement "Above the Arctic Circle, land frozen for tens of thousands of years has begun to thaw for the first time" as being in any way truthful, so it is kind of a moot point. What exactly aren't you buying? That it has been frozen for that long or that it is thawing? Basically, I'm not taking their claims at face value and would like to see some (or a bunch) of supporting evidence (especially since I don't see myself getting up to the arctic anytime soon). There's been way too many climate shenanigans (many of which are ongoing) for me to read a statement like "land frozen for tens of thousands of years has begun to thaw for the first time" and just accept it. "Scientists" have been caught lying about stuff supposedly melting (although to be clear, I'm not accusing those involved with THIS study of lying, just that I'm unwilling to automatically grant them the benefit of the doubt), and the "frozen for tens of thousands of years" part could really do with some substantiation. Thanks for the link! I will certainly read the interview with Larry Hinzman, and likely the related links on that page as well.